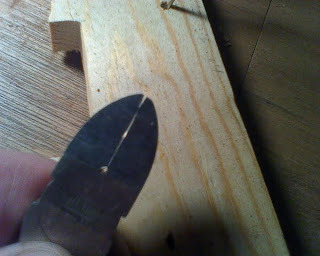 As I mentioned before the ground down diagonal pliers wouldn't cut the tang of the fretwire the tip of these just deformed and are now in the shape of a "v". So I got these end cutting pliers and ground down the end of these flush. They were not quite flush. 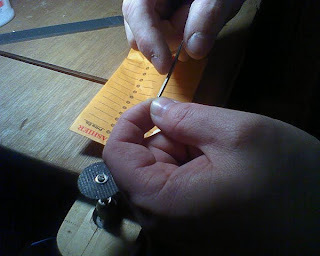 Cutting part of the tang off. Now you can see why it was important to do so. 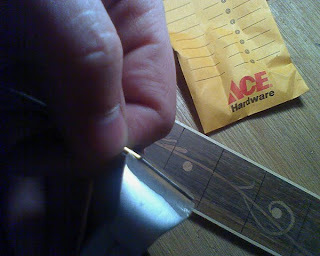 This will look nice because you won't see any kerf-marks or fret wire showing through the side of the fret-board because of this white maple binding. 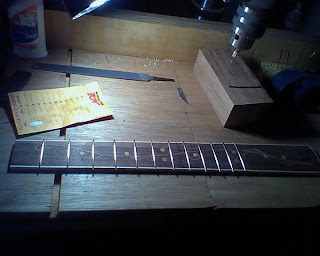 I had to measure and cut each fret individually – this took a while. 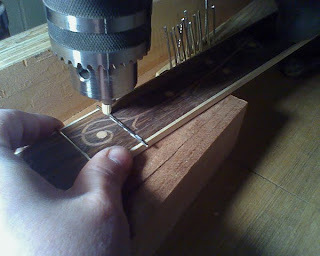 Putting glue on the frets. I used white glue for this – making re-fretting possible in the future. 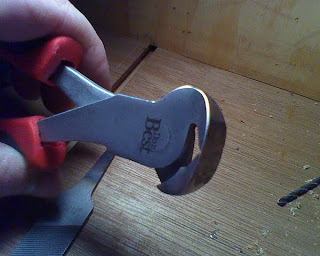 I also used the Dremel a bit to clean up what the end-cutting-pliers left behind. 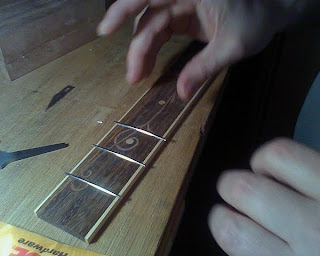 Placing each fret in it's place. 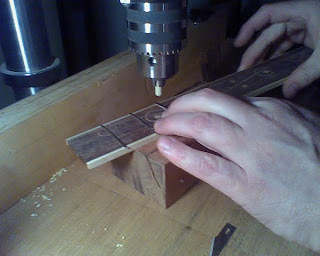 Then I used the drill press and a dowel to seed the fret-wire in the kerf. 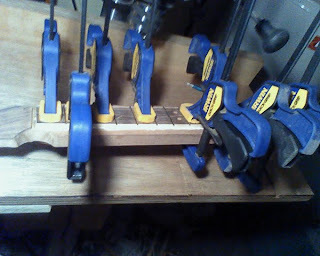 I did make a shaped block for this process but I saw another luthier using this technique above and it just seemed easier. 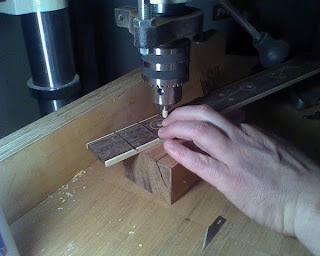 Plus when the dowel started to deform I was able to just put sandpaper under it and turn the drill press on to make a new surface – so simple! More of the same, you can see the glue coming out on the bottom photo. I cleaned that up with a wet rag and then dried it right away with another dry rag. 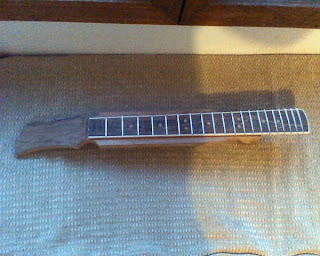 Done and now gluing the fret-board onto the neck. 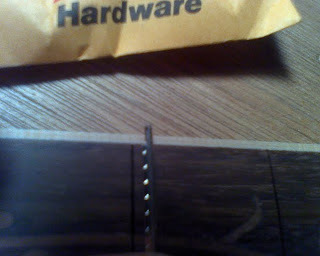 If I had this to do again I would have glued the fret-board on first, then install the frets... My hind-sight is 20/20. Done with the install! Still have some filing to do and some shaping of the underside – maybe tonight. Update: I did finally purchase the book and returned the library's copy back to them... in the drop box – I just couldn't look them in the eye. I'm sure I have some late fees waiting for me!